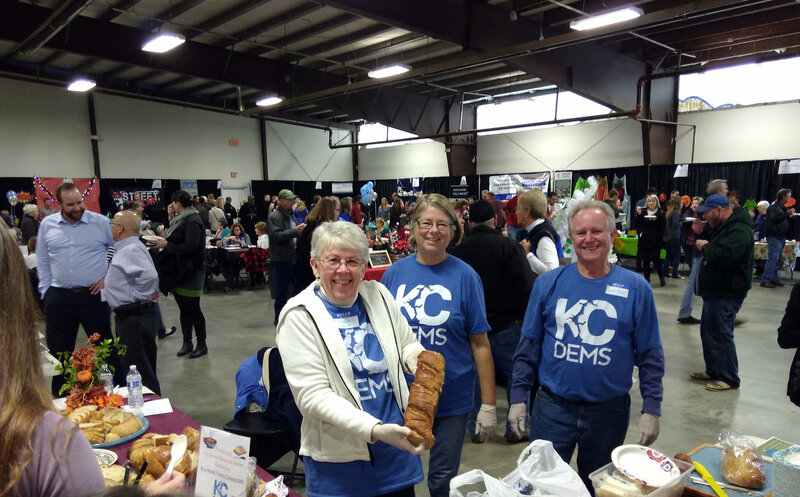 The KC Dems bread team is ready in their KC Dems shirts. 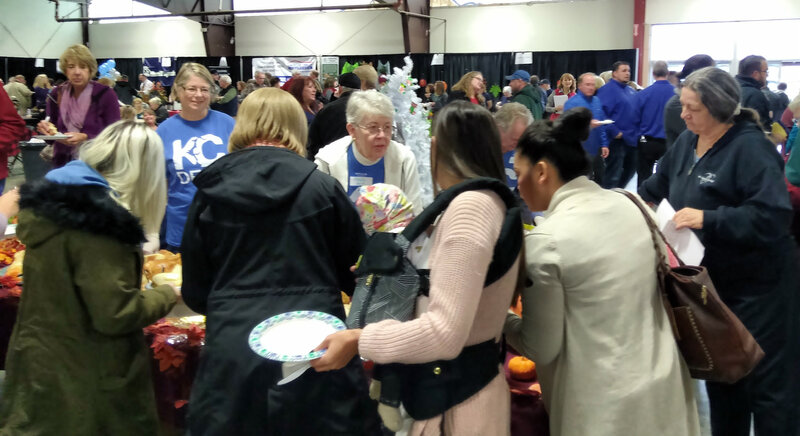 On November 16th, as chilly gray skies and drizzle hung over Coeur d’Alene, Kootenai County Democrats’ Community Outreach volunteers and about 1200 other folks enjoyed the truly warming (heart and stomach!) soup contest event put on by St. Vincent de Paul of Coeur d’Alene. According to an article in the Coeur d’Alene Press the next day, the event raised about $15,000 to support St. Vincent’s numerous programs to aid the homeless in our community. Attendees sampled forty-three delicious soups and stopped by our table for tasty artisan bread and butter. 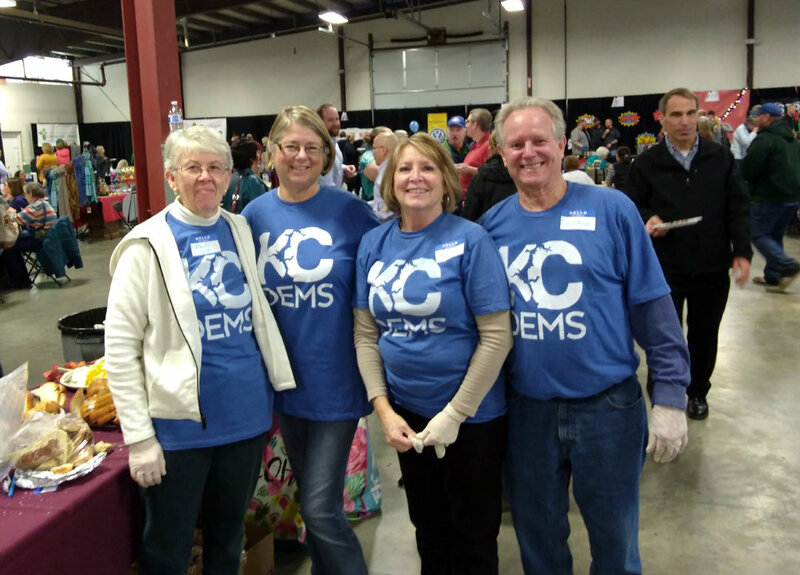 It was great to see quite a few of our own KC Dem friends stop by the table. 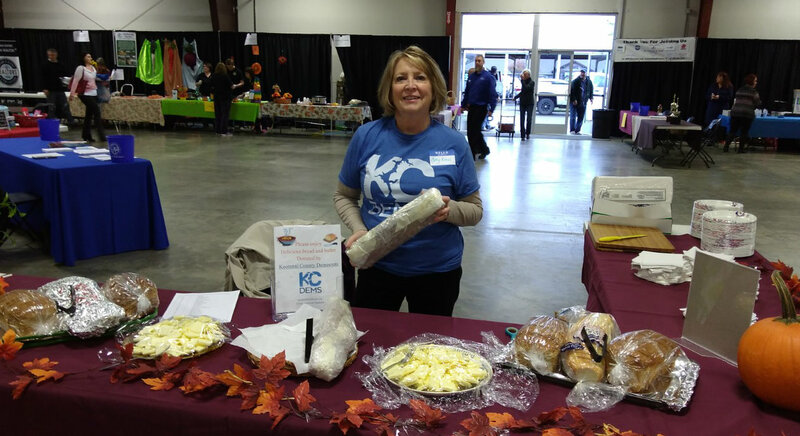 Because of the incredible generosity of KC Dems and their friends, we were able to supply 94 delicious loaves of bread and sixteen pounds of butter for everyone at the event. That achievement is truly impressive and exemplifies what it means to be a Democrat and care about others in our community. Many of the scrumptious loaves of bread were truly a labor of love as many were home-baked by our donors. I’d like to give an extra special shout-out to Mary Foster who made ten loaves of incredible rosemary bread, and to Blair Williams, her husband Jim, and their daughter who home-baked 120 (yes, 120!) garlic herb rolls. That does not diminish the generosity of others who donated bread, butter, money, or their time to this event. All left-over bread and butter were donated to St. Vincent’s to use in their various kitchens and warming shelter. They really appreciated our support and donations. A BIG and sincere THANK YOU to all who participated in any way! Volunteers who manned the bread table at the event were Cathy and Laurie Kraus, Paula Neils, and Gale Stromberg. We hope to see even more of you there next year! Paula Neils displays one of Mary Foster’s honey-glazed rosemary loaves. Community Outreach Chair Cathy Kraus shows off our crumb-free table at starting time.